The Ups and Downs of Being a 16-year-old Grown Up Lady! Err, lady?!?! A'ah.. LADY lah sgt kaaaaaaannnn.. I just noticed that this year, I haven't blabbled about my students yet. Padahal sebelum² ni, by the first week of class there'd already be an entry on my new classes kan..
Two days ago I had my form 3 class in Pt Buntar. To tell you the truth, almost half of the class are my ex-students either since they were in form 1 or in form 2 so I'm used to most of them. Penah gaduh² with them during World Cup 2010 when they were in form 1, penah laugh at one boy (Puya yg ade bulu mate sgt panjang and lentik) coz he didn't know how to whistle and there I was, sengaje whistle kuat² (well, as loud as I could je la) to irk him saaaaaaaaaaampai la dia blaja whistle sendiri hehe.. Anyway, during this particular class, I noticed that a few of the girls had written "Puan Ayu" on the teachers name slot on their book. Oiiii, nape sy tatau pun saya dah kawen? It wasn't just this class, mind you, a few other new students pun ngan selambenye tulis Puan Ayu, ok! So I had jokingly scolded them saying that I didn't know I was married so would they please show me WHO my husband was since I seemed to have lost him. Kelam kabut la kau kan nak padam balik 'Puan' tu hahah..
As I continued my class (we were doing angles in circles so they had to measure the angles they had drawn while I went around checking their work), I had a sudden rush of raised hands, indicating they weren't sure of their work so I had to go check one by one. What amused me was when they asked me, while I was checking their work, "Betul ke cikgu tak kawen lagi?" Aikkk.. sibuk pulak la korg ni! I ignored their questions and laughed while continued to guide them and check their work. However, it seemed that they had decided my personal life was more important than angles from the same chord and they continued to asked me.. earnestly ok! Bkn mcm nak mengusik ke ape ke, but like seriously couldn't believe what I had just announced in class. Yg tak bleh tahan was this boy, Afif Azhan. I taught him since last year. An intelligent boy but VERY quiet.. and boleh tak dia bisik kat sy tanye, "Cikgu, memang betul ke cikgu tak kawen lagi? Cakap laaa.." And not once tau, tp sepanjang kelas he kept pretending of wanting to ask me something about circles and instead kept repeating the question. At first I was amused. But then I realized, they way they were asking indicated that they think I'm married was because to them, I look like a long-ago married woman.. Uwaaaaaaaaaaa~~ Ape ni? And I thought I looked young enough.. When I first started teaching, I had some normal student-teacher crushes which embarassed me more than the student when I found they had written my name and theirs in hearts or within chains at the back of their books or on the desks. I've had students asking me if I would ever like anyone younger than myself, say, like their own age. I've had primary school kids telling me if I'm not married when they grow up, will I please marry them. While all this is amusing and definitely colours my life (chumel ok bile bdk kecik ajak sy kawen! ), I never thought I'd see the day where my students don't believe me when I say I'm not married.. just because they think I LOOK like a married woman! Waaaa, do I really look THAT old?!? I finished my class quickly that day and went home feeling a bit miffed and offended! I made up my mind that this year, I'm no longer gonna tell my students that I'm 16 and am gonna go for a larger number, say, 17? <--Tak maluuuuuuuuuu hahah.. The whole of today, I was filled with this realization that saying I'm 16 has been very ridiculous on my part and that I should stop being so childish..
Sob.. Sob.. there goes my 'innocence'.. I went to todays form 3 class at Jawi feeling more or less like I did yesterday. Was reminding myself to stop joking about being ridiculously young untill.. I was catching up with my ex-student who is in form 4 this year. A few younger kids were passing us and they were teasing my student calling me 'awek'.. Still, I tried to hold on to my new resolve and laughingly told those kids, "Sy ni cikgu laaa.."
Boleh tak budak² tu siap patah balik to us just to take a closer look at me and said, "Tipuuuu.."
Ohh, I'm in heaven! Budak² kan tak pandai menipu. It took a few (lame) attempts from me to prove I'm not a student yg pass as awek budak form 4 before those kids believed me and cepat² mintak maaf sbb 'takut cikgu marah' hahah.. boleh? Now I've forgotten my resolve yesterday coz suddenly sy pass as awek budak form 4.. so still sweet 16 la kannnnnn.. So I got my car back yesterday. An hour before my 4.30pm class, the workshop called saying I could get my car. Seb bek Arep ade umah so mntk tolong dia anto kan ke workshop..
Hmm, terase sgt la menyusahkan umah no 40 ni. Yesterday I had planned to go to class jln kaki kan, but Sepul saw me as I was closing my gate last night and he sent me to class as well as fetched me back when I had finished..
..so tak yah la jalan kaki gi tuition kan cam time form 4 and form 5 dulu! Mekasih jiran²! Gosh! It felt so good to have my car back wpun berpisahnye 2 hari je pun. I didn't have my car for aorund a month ape dulu after the accident, lagi lame. But this time it felt so much longer, tatau nape.. Still, my head masih pening with financial issues ni..
Wow! I hope one day I'll be able to read this without feeling sick to the pit of my stomach..
Nape dia ni still nmpk cool wpun kete rosak? Tak mcm sy pun arituu..
2. Pay at least a third of my Maxis bill. This is the longest my phone has been barred. Usually its ot even one month but as for today, its like 4 months dah kot.. aiyakkk~~ It doesn't help that even though your phone kene bar, your monthly bill still jalan.. nangis ok! 3. Pay utility bills yg bulan lepas tak dpt byr due to budget yg berlari² anak. 4. Pay the house rent.. as usual la.. So that is like the short list off-hand la kan.. But my car had other ideas.. Remember I once wrote that my engine seemed a bit noisier after I got it back from the workshop? I thought it was an aftermath of the accident and that was the best the workshop could do so I didn't really complain or anything. Then a few weeks ago, I noticed that my car seems a bit, how do you say it? Susah masuk gear?!?! Well, after cashing my cheque at Bagan Serai just now, I had originally planned to go straight to the insurance company for the renewal but along the way back to Pt Buntar, I noticed that my car seemed to be.. slow and stalling. I don't know how to describe it but it doesn't feel the way I usually feel when driving and it kinda alarmed me. Since the workshop was nearer than the insurance company, I decided to drop by the workshop first and it was a good thing I did coz as the car neared the workshop, it became harder and more uncomfortable for me to drive. Turned out, my gearbox had gone kaput! I remembered one of the first things Toroque had told me when I first got my car. And as I remember, the words gearbox+rosak should not be in the same sentance as 'takde duit'.. huwaaaa.. I was dreading the quotation.. and sure enough, once I got it, I burst into tears! Ok, I was trying my best to stop but the damn tears just won't do as told.. So many things were going through my mind as the cash I just received barely covered the costs.. and I still needed to at least pay for the insurance and road tax. A quick desperate calculation in my head revealed that I was very much in trouble.. which just made me wanna hide somewhere until I could control myself. I knew, if I paid for the gearbox, I'd never be able to pay for any of the above. Yet I also understood that if I didn't pay for the gearbox, I'd have NO CAR to go to class to get money for next month. I knew I had no choice but.. In the end, I guess maybe because I've been a frequent customer (?) at this workshop, the apek told me that I didn't have to pay the full price yet. It was suggested that I pay around 80% of the whole service and pay the remaining once I got my next pay. That way, I'd have a bit of money to use for the month..
Well, I'm saying je la its because I'm a regular at this workshop.. for all I know, the apek kesian seeing the sorry state I was.. dush! And to tell you the truth, kat office diorg ade tulis this sign that all transactions have to be paid fully, takde utang²! Still, I was grateful.. wpun rase mcm kenape la lantai ni tak telan sy atas rase malu yang amat sgt kat the apek and his wife. And to add insult to the injury (ok, tak la teruk sgt kan), I had to leave my car at the workshop while they worked on it. Tak tau la brape hari kan. But aiyakkk! I REALLY couldn't afford to miss my classes since this was my only source of income. Tambah pulak I have to pay for the fees next month (on top of baru bulan depan leh byr insurance and roadtax kannnn).. Adoi! And I thought my money issues could be solved by the next paycheck..
Seb bek kelas mlm ni sudi dibantu oleh Arep so for tonights class, I already have my helpful neighbour who'd go out of his way just to send and fetch me back (sbb kelas mlm ni kat Jawi kan). Tomorrow night at Pt Buntar and it looks like a very good time for me to have a long walk to the tuition centre memandangkan its within walking distance la jugak.. alaa, dulu form 5 pun jalan kaki jugak pegi tuition. Lagi jauh..
During matriculation at KMK, I befriended a girl who was so different from me. Her name was Ima. She was from MRSM Taiping and wore 'tudung labuh' while the religious-school-goer, ME, just wore the normal type of hijab. She was confident and friendly while I was painfully shy and very unsure of myself. While I tried to hide away from people, she tried her best to include me in the college social circle. There was this time when Miss Marzita (the English teacher) announced that they were organizing an English Camp for the college. This would mean that not only would the USM Matriculation students be in the camp, but it would also include the students from UPM, UMS and KPUTM..
..ok! That alone terrified me! I was still trying to make myself invisible to my fellow MUSM students, ni pulak nak suruh join program with other units so I didn't even consider joining in the program. Yeah right! As if Ima would allow that! Hah! She wanted to go and she had made up her mindI would go too. No, she didn't even force me but she asked me to help her with her appeal letter (Well, CM being CM, had asked those who wanted to join to write a letter to her on why he/she should be chosen to go to the camp) and bit by bit she persuaded me to write my own letter. Of course I didn't want to but Ima was such a sweet girl, you just couldn't say no. Still, I made sure my letter didn't sound like I wanted to go..
Ima was overjoyed since she was also chosen and I was dreading sleeping in a tent at a camp site near Tasik Chenderoh for the weekend. It didn't help when I found out we were in different groups and all groups had a mix of students from the 4 matrix units in KMK. I was petrified, ok! So imagine my suprise when I realized, I actually kinda liked the outdoors! Hah! Who'd've thought.. dah la mase sekolah tak pernah join pun any kind of camping ke ape ke.. not even the camping-tido-kat-sekolah-je. One of the most memorable days was when each group was given a compass and some directions, then we were left on our own to find our way home. It was relaxing and tiring all at the same time. Relaxing coz there were no teachers assigned for each group so we could talk in bahasa for a change. C'mon la, the whole group consist of malays so sape la larat nak cakap English manjang kaaaaaannn.. ok, so some of us still tried to talk in English with each other, as the regulation of the camp, but after an hour or so of treading through the forest..
And the tiring part plak was.. well, the hiking and jungle tracking itself la kan! I was sure I was gonna hate it but though my group got lost (and we somehow managed to find ourselves kat tepi jalan raya! ), I realized that I really liked these kind of activities. Mase ni baru nak nyesal on how much I missed out during school kan.
Hahah.. and who can forget when we had to go through this rubber plantation. You know how the trees are all planted in an organized way? Well, we were kinda tired by then so these UMS boys in my group (somehow, the MUMS students have always been potrayed as the students who know how to have fun as opposed to us MUSM students who seem a bit too serious) gave us an impromptu Hindi song performance while dancing around those rubber trees.. leaving us in stitches. Well, anyway.. we were among the last groups to arrive back at the campsite. By then, my nervousness (does the word even exist?) was gone and I felt really at home with my groupmates. We were given some time to get ready for the night with and interesting activity promised for the night. Turned out, each group had tio perform 2 songs each. Normal activity eh? Well, we, of course, had to chose English songs BUT, 1 song was to be a malay song translated into English. As for the English song, we chose this song..
And why is this song memorable enough that it reminds me of the KMK English Camp more than 10 years ago? Well, when we performed this song, suddenly everyone was in the mood for some campfire singing and before long, the whole camp was singing along with us.. sweet! I went back from the camp a more confident person.. and with more friends. Including the ones from other units than MUSM. I just regret that we don't have any pictures of the camp coz even remembering it all (with my fuzzy memory) has made me smile. Baby, how do I live? 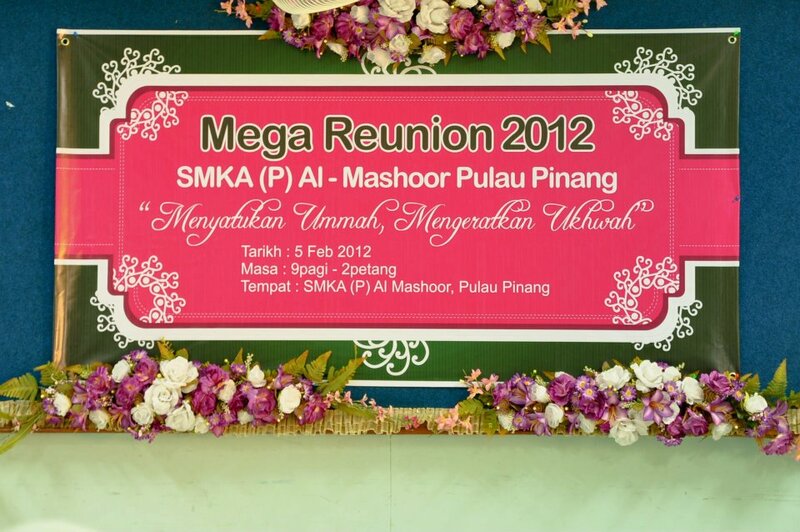 Last Sunday, a few of my seniors in AlMashoor had organized a reunion for our small school.. and I regret to say that I didn't join in. I was so excited about this when kak Rid had suggested it but in the end, due to the budget constraints I'm still suffering since the accident (I know, dah berbulan kan!) and well, also because I had forgotten that I'd promised a teacher I'd take over his class that day, I couldn't join in the fun. Why? Why do I say rugi?!? Coz some teachers also came for the reunion and the school was more than happy to let us use the dining hall for the reunion. I'd joined in on the discussion and was among the first ones to vote for BIHUN KUAH LAKSA as one of the item on the menu.. Somehow, we only find this in AlMashoor. And somehow, EVERYONE wanted Pak Cik Mat to make it hehe.. tp takde rezeki, Pak Cik Mat dah lama gantung periuk. He doesn't do the canteen (ours OR other places) anymore.. rugi nye! Some of the seniors had gone to school earlier for the reunion. Letters and official stuff and they had uploaded pictures of our dear, cute school.. cute?!?! 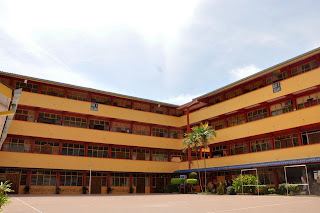 Well, it actually is cute coz I'm pretty sure we're the smallest school in Penang. We only have ONE U-shaped block.. no field but a court in the middle.. and thats all! Comel la kan kirenye tu hehe.. Anyway, from the pictures, I noticed a lot of change in my school.. and I wish I could see it for myself instead of just through the pictures. 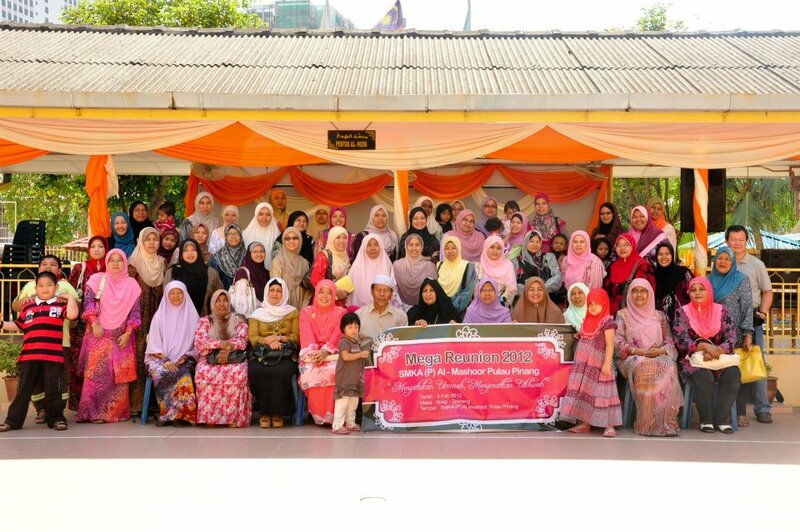 From the pictures posted, I realized that my favourite teacher ever: Cikgu Nooriah (purple tudung) also came! Memang sgt rugi coz I really want to thank her in person for being the one who made me love maths. I always try to be a teacher just like she was but I know I fall short in most things. Still, all the right things I do when teaching is all due to her. Beside her is Teacher Mariah. I never really had any classes with Teacher Mariah but she was the secretary for the school PTA and Abah was the president so I got to know her pretty well, along with her family too. 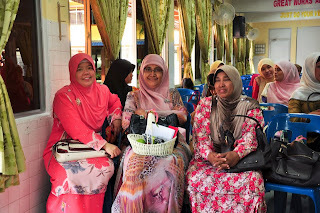 Then there was also Cikgu Pah (sitting in the middle below)! My add maths teacher in forms 4 and 5.. and she doesn't seem to change a bit! Some students were afraid of her.. me included especially since I'm always forgetful about any letters she asks me to give Abah (she was the PTA treasurer). But I love her class. 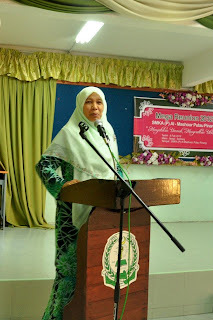 She was the one who made my class take on the Pusat Kecemerlangan Matematik project for our school and I still remember the fun we had in setting it up. Oh.. she also has the prettiest signature in school! All curly and curvy.. tho I never dared to tell her that. 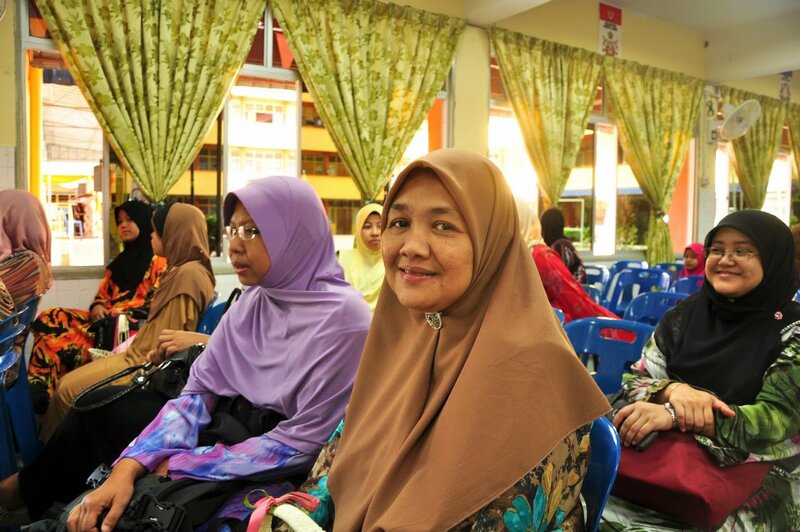 On Cikgu Pah's (Errkk.. Cikgu Shariffah Affiffah!) right is Ckgu Zakirah who taught me for a few months when she just arrived in AlMashoor around the time I was in form 2.. I think?!?! But on Cikgu Pah's left is another favourite teacher, Cikgu Azizah who taught us Kemahiran Hidup.. and she too seems to not hove changed at all.. ehh, ape ni?! Nape cikgu² mcm tk berubah pun?!?! 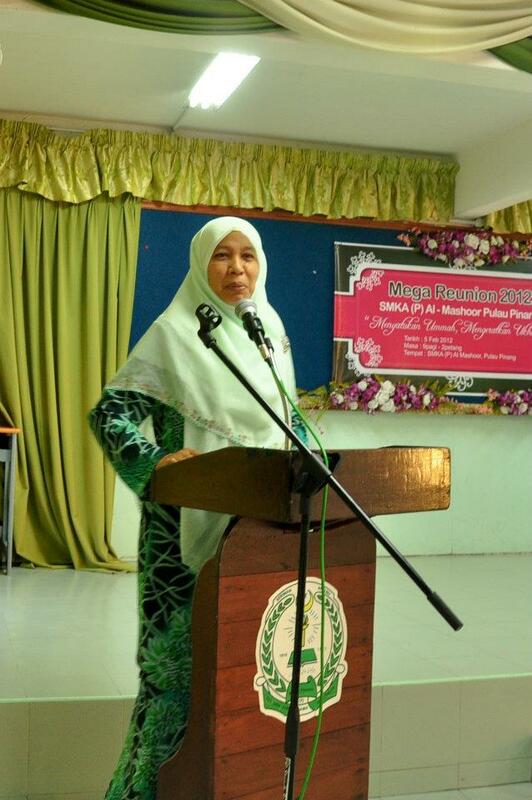 Cikgu Azizah was the most motherly teacher in school. We could talk to her about anything and ask her so many questions about growing up. There was never a dull moment in her class and I really wished I could meet her since my last class with her was when I was in form 3 la kan.
Then there was also Cikgu Khairana.. the library teacher AND pakar Geography sekolah hehe.. and she also doesn't look as if she aged since I last had my class (in form 3) with her.. why ah?!?! Awet mude je pun sumer cikgu² sy ni.. ape rahsia?!?! 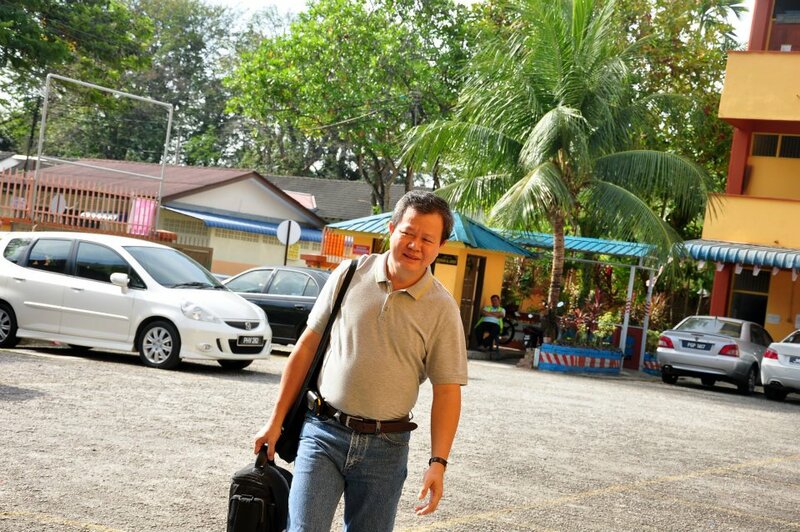 And last but not least.. SIR CHONG!! Hahah.. ok! Those who read my blog since I first wrote this blog would probably notice his name in one of my earlier enties. The teacher I resented only because he had teased me ONCE after a history test in form 2. I didn't talk with him till I was in form 5 (Ohh~~ Sungguh buruk perangai ku) even when he was still as nice as ever. And yes, he is one of the nicest teachers who actually emailed me when he found my email on the net a few years ago. Macam malu kan sy dok buat perangai camtu dulu hahah..
And this is the only teacher who'd use coloured chalks when teaching. He taught me history and the blackboard was filled with his colourful doodles.. till now, he's the ONLY teacher I know who does this! 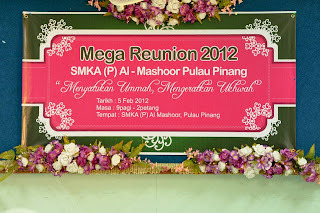 Anyway, here's another picture from kak Melia's FB. My cute and small school. These two joint blocks were the academic area during my time. The third block was the hostel. We only had around 500++ students then.. and that was counting form 6 students. I really wish I had gone to the reunion. 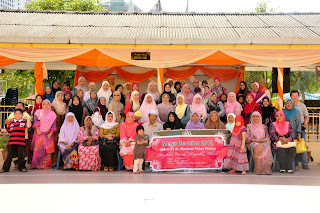 Now I can only hope they'd be kind enough to organize another one (kak Melia ade ckp cam ura² nak buat a bigger one around raya nanti) in the near future. Till then, dok ulang bukak FB kak Melai and Sir Chong la to look at the photos.. This entry was 'dijanakan' oleh tindakan Cikgu Nooriah tagging me to Cikgu Nasar's photo hahah.. Ohhh, berdosa tak klau sy nak tulis pasal dia one of these days?!?! Of course la takkan buh the said gambo, kang kantoi with him, how?! Heheh..
Every raya, my favourite place to go is Wan Chik's house.. and its totally for the GREAT FOOD reason heheh..
Well, naturally the small plateful turned into a few platefuls when you add Izati to the equation and Wan Chik just shook her head seeing me and Izati sharing platefuls of hot nasik with her tempoyak masak. 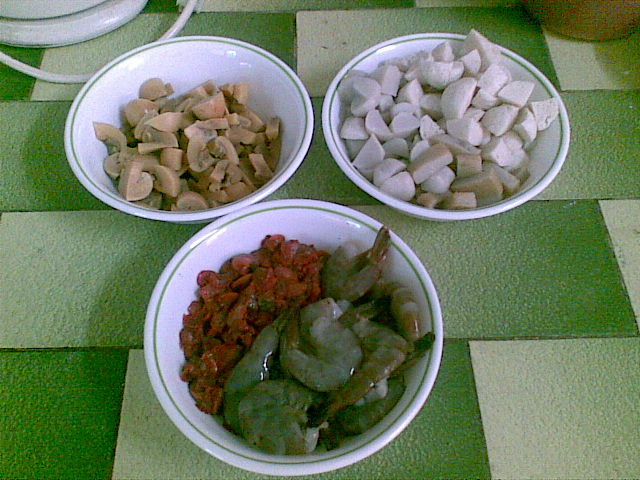 Lauk lain, sumer dah ditolak ke tepi, hokey! Anyway, during raya, its her rendang and daging masak hitam. We'd call her from Penang otw to Kuale (we here refers to me and Izati.. whom Mama refers to as 'anak sedare Wan Chik yg buruk perangai' haha..) and remind her to keep some for us as we're keeping our tummies empty just to fill it with those raya specialties. However, the past few years have seen us liking another dish she loves to make, especially since they now have to cut down on the red meat due to age (Hahah.. makcik ku dah tua!). Now, I never really liked eating this kind of food in public since I'm not really the neatest eater.. tp umah Wan Chik je pun kan! She doesn't even have to serve it to us as we'd sometimes just go straight to the kitchen for it. Once, I asked her how she makes it and she gave me a 'review' of making it since you know la how org dulu² masak bukan tau nak sukat², main agak je pun bleh sedap, kan. I had planned on making it for a while now (I asked her ade kot 2 years ago) but never really got the chance (or kerajinan) to make it myself. The living-alone excuse is also something I'd use here jugak and I'd rahter wait for the two yearly rayas to eat her konpem-sedap one as opposed to ntah-ape-rasenye-nnt version I might make. Somehow, this month has seen me a bit rajin in the kitchen. And when I say rajin, I mean that I cook my meals almost everyday. The almost bit tu sebab when I cook, I usually have to eat the same thing for the next 4-5 days since I'm living alone and you can't possibly cook in too-small portions, kan? And yes, that also means a bit rajin going to the market in Pt Buntar hehe.. boley? So there I was one Sunday morning, buying a few thing I thought I'd need for what I was about to make. So I'm not good at the main-agak-je-bile-masak thingey.. but hey! I DO try! Back home, I cut up the shallots and garlic. Then washed and cut some other thingeys I got at the market..
..waaaaa! Sgt suke ok bile tgk ade org jual KERANG yang dah takde kulit.. senang keje sy heheh.. Got half a bowl for only about RM2. 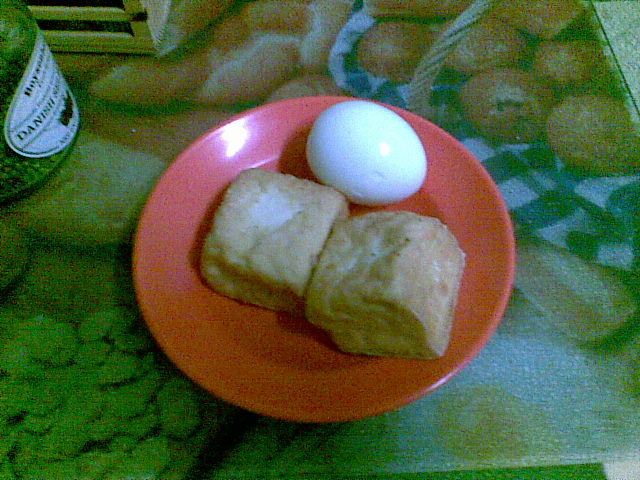 Then I fried some tauhu and boiled some eggs since people usually put this for the garnishing..
and then I started to cook while trying my best to remember what Wan Chik told me. And an hour later, I had some piping hot gravy.. yeay! So here it is, presenting my first ever MEE KARI! Heheh.. ok! 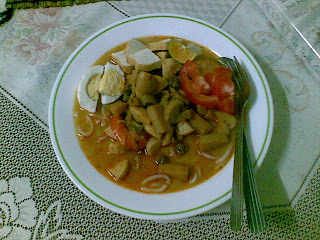 So dah nak masuk 32 16 baru nak masak mee kari for the first time? The taste? Okay la.. but still not confident to make for guest since Wan Chik punye somehowtaste way better than this one. Hmm, looks like I need a few more experiments first la kot ehh..